E.J. Miller, a tattooist and supplier, worked in Norfolk, Virginia for many years. Miller operated the Idle Hour Curio Shop and Tattoo Shop on the famous East Main Street. Norfolk is a shipping and shipbuilding center, and together with Portsmouth and Newport News, makes up the Port of Hampton Roads. This area is the home for the United States Atlantic Fleet and a major port for ships from around the world. Back in the day, East Main Street was the hub for sailor's entertainment; it was lined with restaurants, bars, tattoo shops and other sailor necessities. In 1918, Elmer Getchell's tattoo shop at #611 East Main Street was listed in the city's directory for tattoo shops on East Main. For the next three decades East Main Street saw many tattooists come and go. Most of the shops were in a four-block strip from the 200 to the 600 blocks. City directories show tattooing at #213-405-427-429- 601-611, and more. E.J. 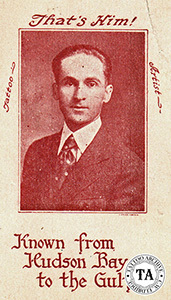 Miller first showed up in the directories in 1922 working at #526 East Main. He stayed there until 1927 when he moved on to #431. In 1935 he moved again to #433. East Main saw tattooists jumping around from one storefront to the next, looking for cheaper rent or some strategic advantage. Cap Coleman himself worked at several different locations on East Main! Advertisements for Miller's tattoo supply business were seen in Billboard Magazine and Police Gazette as early as 1924. Miller's business was modeled after the successful formula that Percy Waters pioneered. As a matter of fact, the machines that Miller sold were probably Waters' "No Name" models. 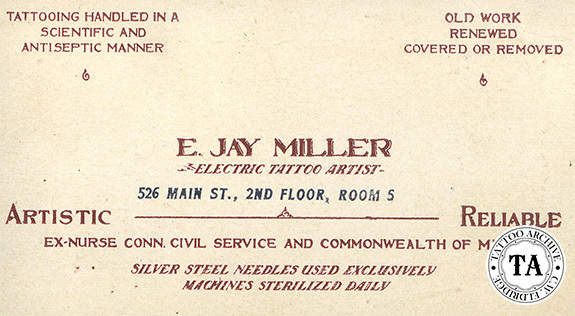 Miller did offer a few items that were unique to that era, like his white enameled machines and business card cuts. He was one of the first to offer adhesive tape for bandages. The hammer dropped on tattooing in Norfolk in 1950 when the re-development committee and the health department conspired to shut down tattooing there. In the Tattoo Archive's records E.J. Miller was not heard of again.